Romano, M. S., Li, N., Antiohos, D., Razal, J. M., Nattestad, A., Beirne, S., Fang, S., Chen, Y., Jalili, R., Wallace, G. G., Baughman, R. & Chen, J. (2013). 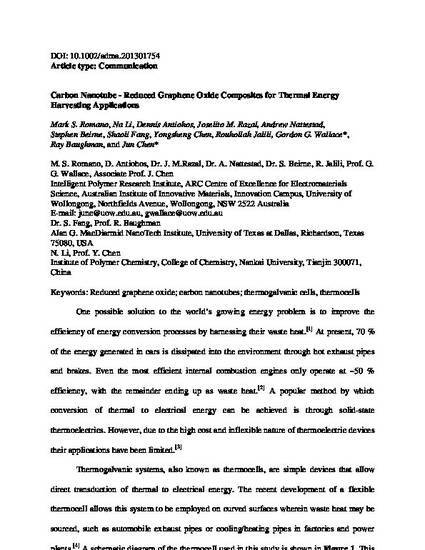 Carbon nanotube-reduced graphene oxide composites for thermal energy harvesting applications. Advanced Materials, 25 (45), 6602-6606. By controlling the SWNT-rGO electrode composition and thickness to attain the appropriate porosity and tortuosity, the electroactive surface area is maximized while rapid diffusion of the electrolyte through the electrode is maintained. This leads to an increase in exchange current density between the electrode and electrolyte which results in enhanced thermocell performance.